Congratulations to the winner – Liz Burton! Well finally the better weather has arrived and I’m sure many of us are now heading outdoors to do up the garden or spend quality time on outdoor adventures. With that in mind I’m thrilled that Amara Living has offered me this amazing Hang-in-Out Cacoon as a prize for this week’s giveaway. 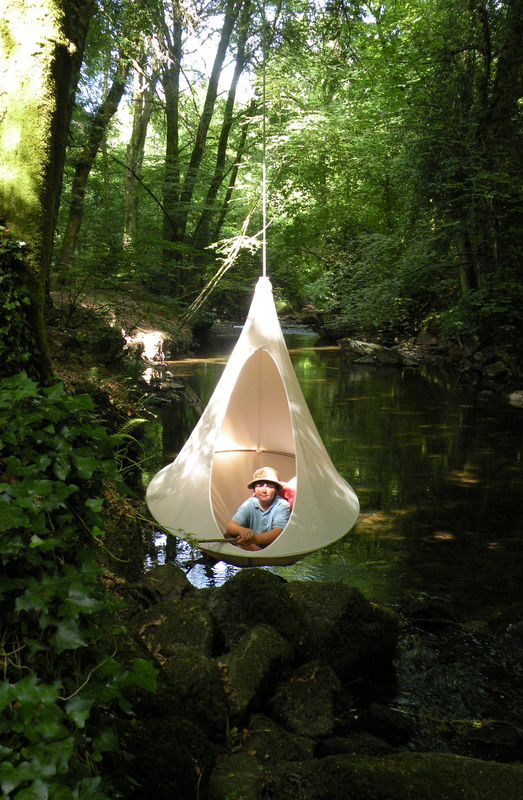 With a Hang-In-Out Cacoon you can forget your troubles and hide away alone or together in your own sheltered hanging haven. Suitable as a hidey-hole for children or a grown up escape, the Cacoon is a must-have accessory for all homes and adventures! Crafted from a durable blend of cotton and polyester, this mould, water & UV resistant item is protected from the elements & features a sturdy rust proof aluminium ring, to keep the base shape when being sat in. 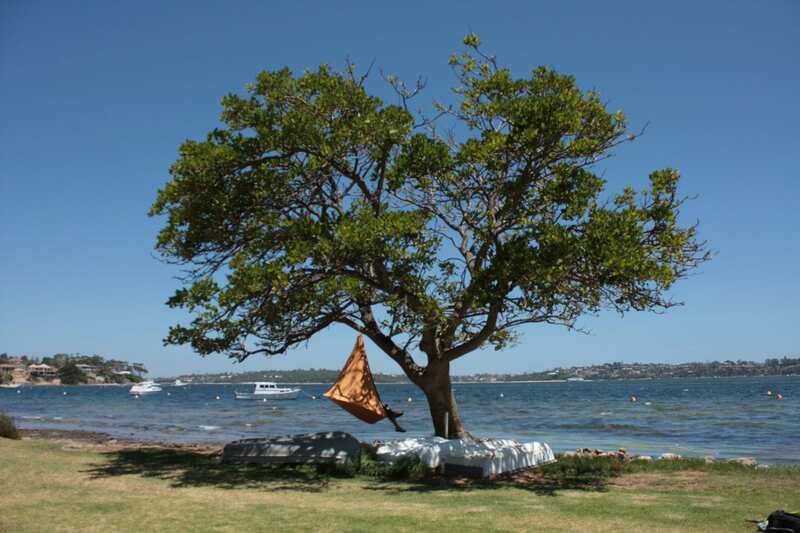 Extremely versatile this private getaway is suitable to use in the home & garden, or for camping/sailing holidays and can be hung from a variety of places. The relaxation refuge folds down to a manageable size (single 20x70cm) and a handy carry bag is included to transport the must-have accessory anywhere you wish. Amara Living is a wonderful site full of gorgeous contemporary home interiors so do check it out if you’re interested. So what do you need to do to be in with a chance of winning this stunning prize? Read on to find out! Tweet – #Win a Single White Cacoon from @amaraliving worth £225 with @lovechicliving http://wp.me/p2djcQ-1ka – and then leave a comment saying you’ve done it. You must leave a separate comment for every entry that you do for it to count. 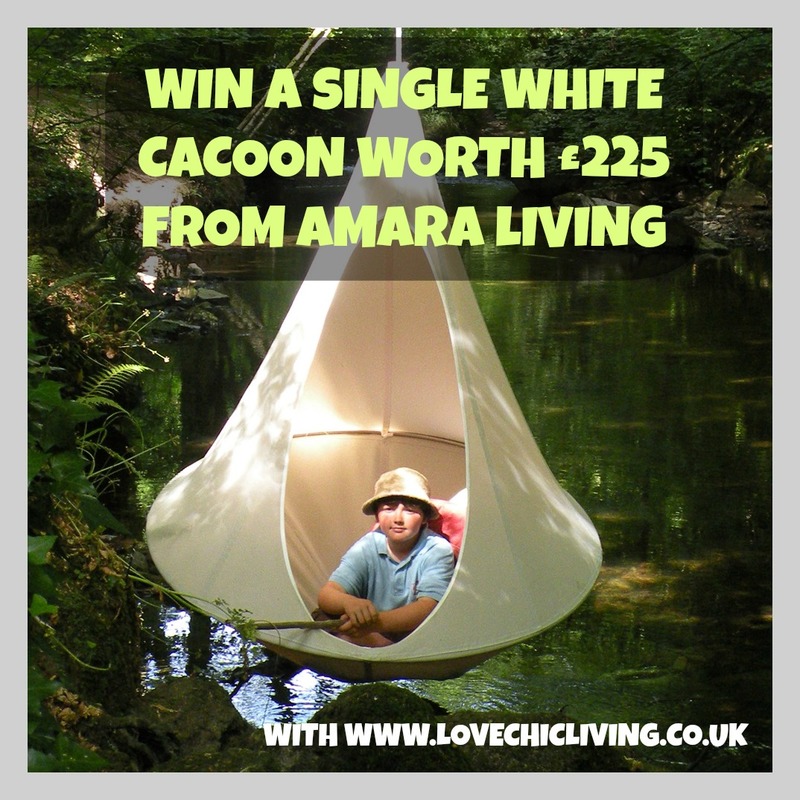 The prize is a Hang-in-out Single White Cacoon worth £225 from Amara Living. There is no cash alternative. Disclosure: This post contains an affiliate link which means if you purchase anything from the site after using my link I will earn a small amount. All done, tweeted, added email and liked facebook. And I have also liked on FB as well! And Subscribed to Love Chic Living by email. Done all the above liking sharing tweeting @spottedpage and also signed up to newsletter. Lovely prize..
tweeted as @magicmoondust love the giveaway I neeeeeeed one of these bad. Commented :)would love to win! I am subscribed to the Love Chic Loving blog with the same address provided when leaving these comments. Is a wicked treat, so cheers Amara Living! Now this way to @dread8484 please be giving! I have tweeted to win! I have liked your page on Facebook! I have tweeted link. Cacoon is fab…..went to a spa last week and discovered a cacoon. Exellent way to relax….I seriously want one now….. I tweeted, this prize looks so great. We have the perfect tree in our garden. Following and retweeted- loving the look of it! following both pages and tweeted!!!! I love this, its so different. Give me a tree and a book and I’d be well away! Love learning about new products. Thanks for sharing. Subscribed to Love Chic Living. I have tweeted your message. Liked Love Chic Living on FB. Tweeted 🙂 fantastic prize, love it! Now got fingers crossed for a little bit of luck – these are so cool and a perfect little hideaway to enjoy some peace and quiet, read a good book, and be able to observe wildlife. I’ve tweeted, liked on Facebook and followed on Twitter. ….and have followed via email! Thank you for a fabulous giveaway – I can just see myself chilling in that this summer! Thank you both for the lovely competition. Thanks again and good luck everyone. Subscribed in the top, right-hand corner, 😉 LOL! And liked on twitter too! Thank you for another amazing competition!